Sudo and Natsuyaki both support their group by bringing out their abilities in different ways. The same age, yet different types, we hear how the two of them do their best. While the two of you are the same age, your characters are remarkably different. I feel that the two of you take opposing approaches, though the both of you want the same thing: for the group to become even better. Sudo: Probably, we're completely different. 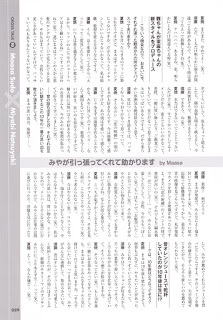 Natsuyaki: Maa's level-headed, while I'm not, so we're already different from that viewpoint (laughs). 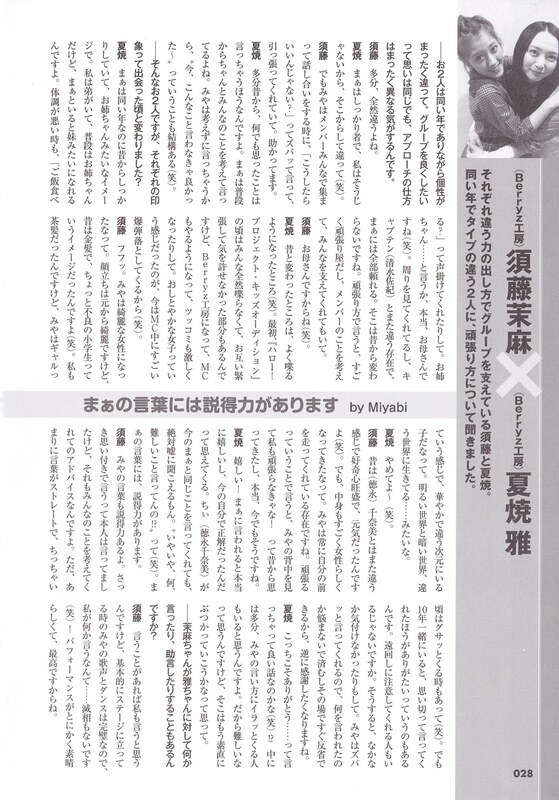 Sudo: But when all the members are gathered around and discussing things, Miya would say things directly, like 'Wouldn't it be better if we did things this way?' You'd take the lead. That's a great help. Natsuyaki: Probably from way back, I'd say what's on my mind. You'll usually say things while properly thinking about the others. but I often say things without thinking, so I often catch myself thinking that it would have been better if I hadn't mentioned something (laughs). Between the two of you, has the impression you have of one another changed from when you first met? 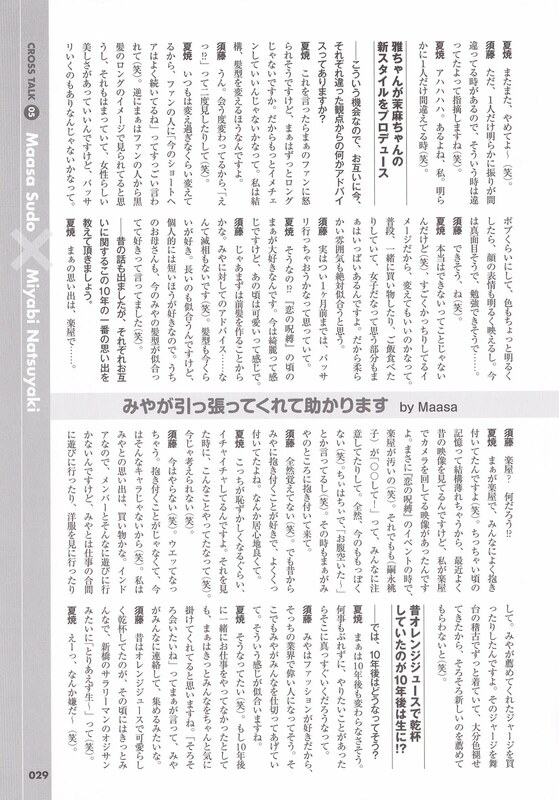 Natsuyaki: Maa's always been level-headed even though we were the same age, so she's always been like an oneechan to me. I've got a younger brother, so I'm normally an oneechan, but when I'm with Maa, I'm like the little sister. When I'm not doing well, she'll ask if I've been taking my meals. An oneechan.... Or rather, you're actually a mother (laughs). You watch those around you, and separately from Captain (Shimizu Saki), we can rely on Maa for everything. That hasn't changed from the past. On the hard-working side, you're a really hard worker, and you think about all the members, you support all of us. Sudo: Since I'm the mother (laughs). Natsuyaki: As for what's changed from the past, you've gotten better at speaking (laughs). At first, at the 'Hello! Project Kids Audition', no one talked at all, we were both nervous and on our guard, but when we became Berryz Kobo, you became able to MC, and you could deliver intense tsukkomi. You were like a meek girl, but now you can drop some amazing bombs in the middle of MCs (laughs). Sudo: Fufu. Miya, you've become a lovely lady. Your looks had always been pretty from the start, but you were blonde back then, so I thought of you as being a bit of a primary school delinquent (laughs). I was brunette as well, but you were like a gyaru, so florid that you could have come from a different dimension. The world of brightness, the world of darkness, you lived in a different world...... something like that. Sudo: In the past, you were brimming with curiosity in a different way than (Tokunaga) Chinami, full of spirit (laughs). But, you were really girly inside. Miya, to me, you're someone who's always one step ahead of me. When you talk about me working hard, I've always thought that looking at you from behind made me will myself to work harder! That's true, even now. Natsuyaki: Thank you! It makes me really happy to hear you say that. It makes me feel that my current self was the right choice. Chii (Tokunaga Chinami) said the same thing that you did, but coming from her, it sounded completely fabricated.Like I was wondering if she had something troublesome to say (laughs). Maa's words have persuasiveness behind them. Sudo: Miya, your words have persuasiveness to them as well. Just now, you said yourself that you'd mention your ideas, but it was advice that came from thinking about all of us. It's just that your words are quite direct, so there were times when we small that it gave us a shock (laughs). But having been together for 10 years, there are times when I'm grateful that you say things resolutely. Since there are people who'd also give advice in a roundabout way. You speak frankly with everyone, so there's no two ways about what you say, everything gets settled and we can reflect on it immediately, on the spot, so instead, I'm grateful. Natsuyaki: I should be the one who's grateful...... Is it fine for us to talk about this though (laughs)!? I think that there probably are people who get pissed off inside with the way I say things. So I think it's complicated, and it might lead to a direct conflict. Maasa-chan, do you have anything to say, any suggestions for Miyabi-chan? Sudo: I think I'd say something if I had anything to say, but basically when Miya's on-stage, her singing and dancing are perfect, so for me to say something...... It's out of the question (laughs)! Since your performances are wonderful, they're the best. Natsuyaki: There you go again, stop that~ (laughs). Sudo: It's just that, there are times when you alone clearly make a mistake with your moves. So at those times, I have to point out your mistakes (laughs). Natsuyaki: Ahahaha. That does happen to me. Times when I'm clearly the only one who's wrong (laughs). Since we have this opportunity, do the two of you have any advice for one another, looking from different points of view? Natsuyaki: It might anger Maa's fans when I mention this, but Maa, haven't you always had long hair? So I think it would be better for you to undergo a bit of an image change. I tend to change my hair often myself. Sudo: Yup. Since your hair changes every time I see you, I have to do a double take (laughs). Sudo: Seemingly capable, huh (laughs). Natsuyaki: I don't mean to say that you're incapable (laughs), but you seem to be very on-point, so maybe a change would be good. Normally, when we go shopping or for meals together, I think you've really got quite a lot of girlish aspects to you. So I think that a lighter mood will definitely suit you. Sudo: Actually, up to about a month ago, I was thinking about getting it chopped off. Natsuyaki: Really!? I liked your during 'Koi no Jubaku'. It's pretty now, but back then, it was cute. Sudo: Well, I thought about starting with forelocks. As for advice for Miya...... it's out of the question (laughs). I like your hair how it is now as well. Long hair suits you as well, but I personally prefer it short. Even my mother has said that she likes how your current hairstyle suits you (laughs). You touched about the past, but could you tell us about the biggest memories you have about one another over these past ten years. Natsuyaki: Backstage, Maa would often hug everyone (laughs). My memories of when we were small have mostly faded, so I've been watching a lot of our old videos recently, and there were videos where I was in charge of the camera. It just happened that backstage, during a 'Koi no Jubaku' event, the place was filthy (laughs). So Momo was like 'Do this! ', warning everyone. Nothing like the Momo of today at all (laughs). Chii being Chii, she was complaining of hunger. And then Maa came to hug me. Sudo: I don't remember at all (laughs). But I liked to hug Miya from way back, so I'd often stick to you. It was pretty cozy. Natsuyaki: It almost made me embarrassed, you were fooling around with me. When I saw that, I was reminded of that (laughs). It's something that's unthinkable now (laughs). Sudo: I don't do it now (laughs). It'd be yuk. It's not the hugging, it's because I'm not that kind of character now (laughs). My memory of Miya is going shopping. I'm the indoor type, so I don't really go and hang out with the members, but when I hang out with you when we have some time between jobs, we'd go and look at clothes. I bought a jersey on your recommendation. I always wear that jersey to play practices, so it's faded considerably, so I should get a new recommendation (laughs). In the past, they toasted with orange juice, so it'll be draft beer 10 years in the future!? Well then, how do you feel you'd be like in ten years time? 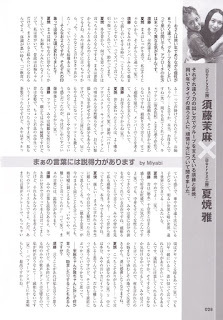 Natsuyaki: I feel that Maa won't change even 10 years in the future. She won't waver with whatever she does, and she'll head straight to what she wants to do. Sudo: Since Miya likes fashion, I feel like you'd become a big shot in that world. And through that, Miya would do all of us up. I feel that'd suit you. Natsuyaki: I'd like that to happen (laughs). Even if we aren't working together in ten years time, I think Maa would still be concerned with all of us. You'd tell me when it's time that we should meet up, I'd contact everyone, and we'd gather up. Sudo: In the past, we sｗeetly made a toast with orange juice, but at the time, we'd all surely be like 'Anyway, let's have some draft beer~', like middle-aged salarymen from Shinbashi (laughs). Natsuyaki: Eh- I'm not up for that~ (laughs).